Shaun Dodimead had initially accepted the offer to direct Patience and had made plans to set it in the world of Gok Wan and ‘fashion gurus’. 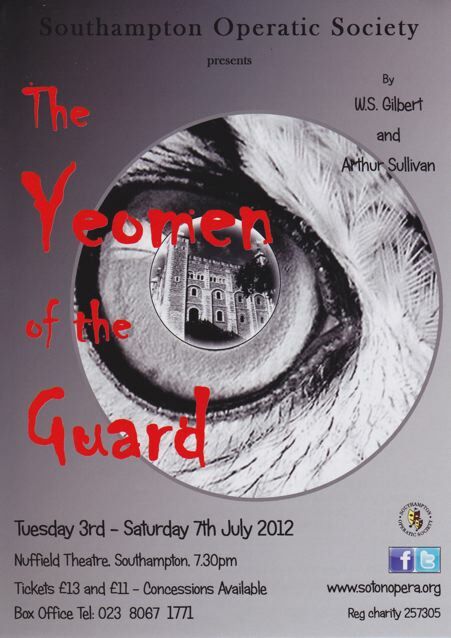 However, having given the project some thought, he decided that this theme was already out of date and suggested a production of The Yeomen of the Guard instead. Patience never sells very well and, as MD Nigel Finch was also happy with the change, the Committee sanctioned it - provided he was not moving the storyline to a Rwandan prison camp or similar! It was, after all, also going to the Buxton International G&S Festival. Although Shaun’s production of Yeomen was essentially traditional, there were some interesting deviations from the norm. Elsie Maynard and Colonel Fairfax were no longer the usual upright characters as both now had a dark side and were very much looking out for their own interests - the opera ended with Fairfax stabbing Point! A lot of significant action in Yeomen takes place off stage and is then related to the audience by dialogue, so Shaun attempted to improve this situation. He arranged for Phil Moody to build a set that contained Fairfax’s cell, the front wall of which would become transparent by adjusting the lighting, allowing the audience to look in. Thus, they were able to actually see Fairfax marrying the blindfolded Elsie and watch him disguising himself as a Yeoman and escaping. In Southampton, there were many comments of approval about the ‘extra action’ but the adjudicator in Buxton thought it distracting. The overture was also used for the company to act out the three days prior to the beginning of the story (as described in the libretto). This sequence ended with ‘the fire in the Beauchamp’ and the acting must have been good because on hearing the cry “Fire!” one of the Nuffield staff rushed to evacuate the theatre! Show week began with possibly the poorest SOS tickets sales ever, but word of an ‘entertaining Yeomen’ must have spread as there were over 300 ‘walk-ups’ during the week. Unfortunately, it still lost £2448 – perhaps Patience would have fared better?